David Morrell’s Creepers was a publishing event, a powerful, edgy, dark thriller by a master of the genre. A New York Times bestseller, it won the prestigious Bram Stoker Award and earned numerous critical raves. Scavenger, Morrell’s follow-up novel, takes us in a harrowing new direction: a desperate high-tech scavenger hunt for a lost 100-year-old time capsule. Frank Balenger, the resolute but damaged hero of Creepers, now finds himself trapped in a nightmarish game of fear and death. To save himself and the woman he loves, he must play by the rules of a god-like Game Master with an obsession for unearthing the past. But sometimes the past is buried for a reason. Scavenger is a brilliant, frightening hunter-hunted tale that layers modern technology over the dusty artifacts of earlier times. The result is a surreal palimpsest, one that contains the secret of survival for Balenger and a handful of unwilling players who race against the game’s clock to solve the puzzle of the time capsule, only to discover that time is the true scavenger. 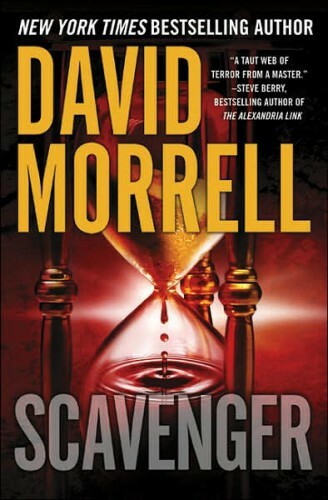 Morrell’s trademark action sequences are embedded with fascinating historical clues that make Scavenger a thrill-a-minute page-turner as well as a mesmerizing literary experience. I so enjoyed the eerie feeling of Creepers that I wanted to write another book like it. A newspaper article about lost time capsules inspired me to explore that topic. I particularly enjoyed learning about the eerie Crypt of Civilization at Oglethorpe University in Atlanta, Georgia. Then I realized that Creepers, too, was about an obsession with the past, in that case, an obsession with exploring old, abandoned buildings. The parallel topics involving the past prompted me decide to make Scavenger a sequel and to bring back Balenger and Amanda from the prior book. The title Scavenger was inspired by something John Barth once wrote—that the obstacle race and the scavenger hunt are the oldest of human sports and perhaps the subject for the oldest stories. An obstacle race and a scavenger hunt—the more I thought about it, the more I realized that those elements are the essence of thrillers.